It was built on the land measuring 2 ha in the middle of the protected forest teak tour. 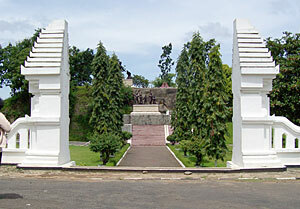 It was the Pillar Monument of the Struggle for Indonesian nation especially Madiun against the PKI ferocity (the Party of Indonesian communists) on 1948. It is located about 8 km from Madiun city to the east side, precise in Kresek village, Wungu district. Around this location is used for the Scouts Camp or the Public Camp. With the spirit of Madiun people heroism opposed the ferocity of PKI. The Pillar of the History was the bitter memory that not forgotten and ought to be recalled by the younger generation of the nation goal in fighting for Pancasila and UUD 1945.